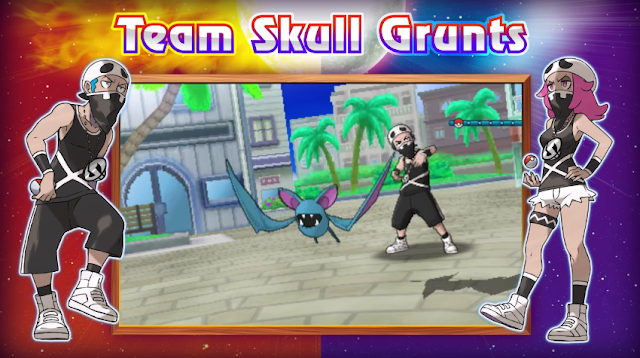 KoopaTV: Meet Team Skull in Pokémon Sun and Pokémon Moon! First of all, there's Wishiwashi. This guy is the class fish you see in elementary schools. She's all for education, and like a public teacher's union, explodes in wrath if she doesn't feel like she's been treated right. There is also Morellul, a Grass/Fairy mushroom that specialises in Spores (joining a tradition established by Paras, Shroomish, and Foonguss). 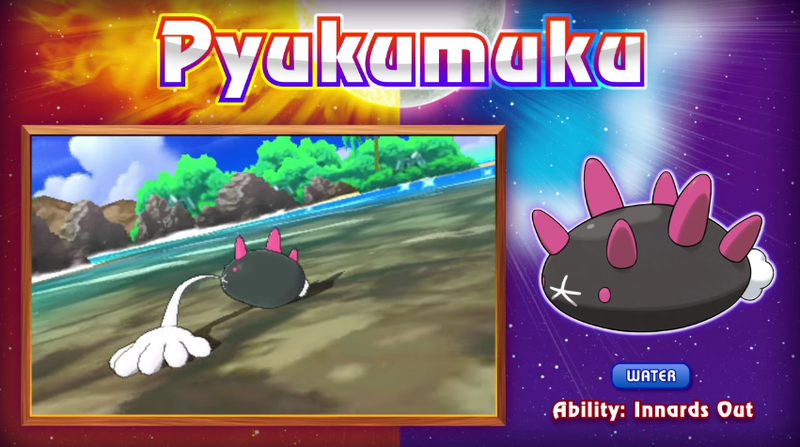 Then there is Pyukumuku, the Sea Cucumber Pokémon and therefore not related to the humu humu nuku nuku apua'a, which is a fish (and former NSider Knight of Hyrule). Pyukumuku is basically the hand in the toilet from The Legend of Zelda: Majora's Mask. Pyukumuku's Innards Out ability punches you with its innards if you make it faint, as a sort of last-ditch strike. The damage it deals is equivalent to the damage you did to it to make it faint, so obviously you want this guy to have terrible defence stats and high HP. He also has an unfortunate life in general, and the local Alolan people pity it. There are three new Alola form Pokémon: Raichu, now an Electric and Psychic type that surfs in the air on its surfboard-esque tail; Marowak, now a Fire and Ghost type, and Meowth, now a Dark type. 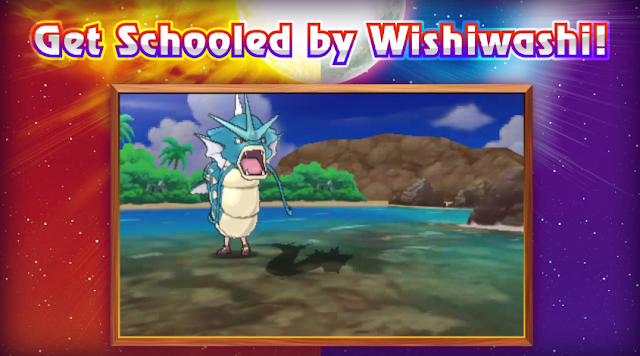 Gyarados is clearly bored at school. Now that it has legs, it can run out of class! Meanwhile, there's no Alolan Cubone. Basically, Cubone in Alola has a choice: Die, or Evolve and Die. The second choice also involves death because, y'know, Alolan Marowak is also turning into a Ghost type. Of course, there was that one Marowak back in the Lavender Town's Pokémon Tower that knows all about being a ghost, but that was just one Marowak out of the tens of thousands of Marowak out in the world! It's not like they ALL died. So: Team Skull. This is the new villainous team. I like them a lot, already. Here's their page on the official site. 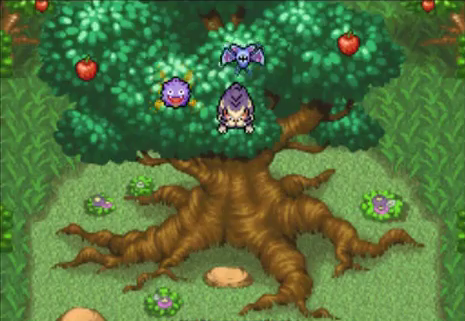 Of course, Team Skull already was in a Pokémon game, as an antagonistic group of Zubat, Koffing, and Skuntank in the Pokémon Mystery Dungeon: Explorers set of games. Here is Team Skull about to jump out of a tree. ...Well, only Skuntank will be jumping. Zubat can fly and Koffing floats. How can there be two Team Skulls? Well, what if they are really one and the same? After all, the whole point of Pokémon Mystery Dungeon is that a human turns into a Pokémon. What if after Pokémon Sun and Pokémon Moon, Team Skull's leader turns into Team Skull's Skuntank, and then seeks out Koffing and Zubat? Or maybe the minions were humans as well. LOOK. IT'S ZUBAT. RIGHT THERE. MY THEORY IS CHECKING OUT SO FAR. But I guess I should go back to talking about Pokémon Sun and Pokémon Moon. We don't really know what Team Skull's deal is, or if they're even all that bad. They're sharply dressed (though the grunts have to pay for their own outfits) and their music style is something that hasn't been seen in a Pokémon game before. It reminds me of Nathan Copeland's theme from No More Heroes 2: Desperate Struggle, though. And I liked that. Guzma looks like the failed attempts of people trying to make a Ludwig Von Koopa Mii. 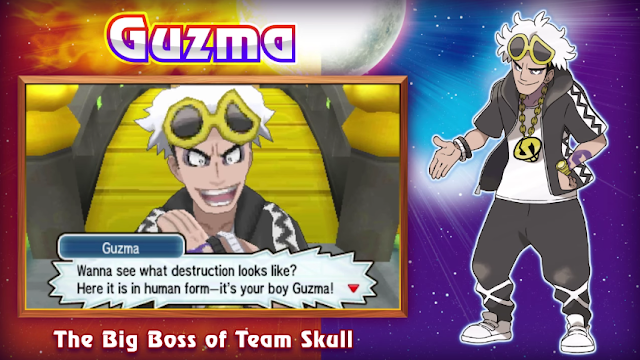 Guzma is Team Skull's leader (and a future Skuntank). He couldn't be a trial captain of Alola, but there's probably more to him making a gang than being upset over that. His own sense of style is the weakest of Team Skull, as demonstrated by his asymmetric sunglasses. 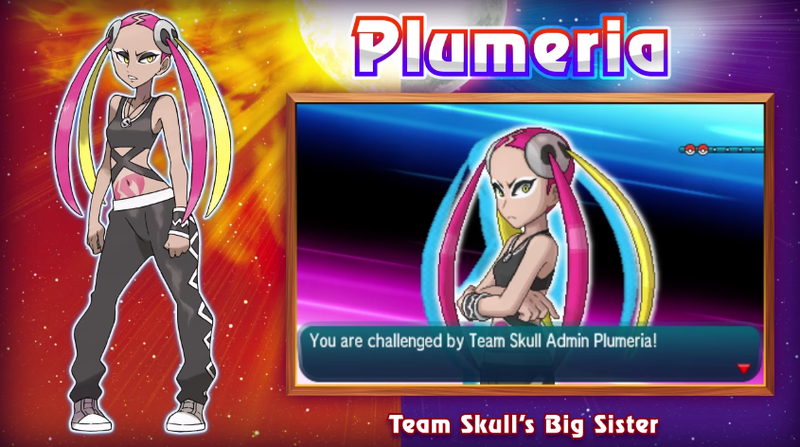 The special effects Pokémon Sun/Moon use make it look like Plumeria has blue hair, too. Lastly, there's Plumeria. I'm not gonna go out and say she's cute or anything, but she's an improvement compared to Team Flare, at least. Plumeria's bald spot concerns me. As does her overuse of eye-shadow. Not my kind of girl. I do at least like Team Skull's female grunt, however. Anyway, I agree with the decision to focus on a smaller sample of villainous team admins and actually develop them, unlike the mess of Team Flare in Pokémon X and Y where the admins weren't actually differentiated. Ludwig encourages you to purchase Pokémon Mystery Dungeon: Explorers of Sky for only $9.99 on the Wii U Virtual Console! He also encourages you to Follow him on Miiverse at NNID PrinceOfKoopas, where he goes out of his way not to even try to make his Mii look like him. The next news release is one new Pokémon, and is a week after this. Ludwig provides a visual example of how Ludwig Mii attempts look like Guzma here. Good theory about Team Skull's connection in PMD2. I don't like Alolan Raichu though. It's like a mix of Raichu and Audino. I'm not a fan of Audino, and I'm pretty neutral on Alolan Raichu. I'm just wondering if we'll get a Surfing Raichu minigame. This gives me a sudden urge to replay Sky for about the 18th time. The game is amazing, certain parts just anger me. Obvious question: Which ones and why? dem ghosts going through walls and onix being 18 stories high. Ghosts doing that is fair. My problem with PMD1 and PMD2 is that any 3rd dude you try to have is totally discredited because of the story. So far I like Team Skull better than Team Flare, although that's not saying much. I'm going to need to see more of them to rank them any higher, but it's good they at least clear that very low bar.